This is how chains were made before machinery was developed in the 19th century. A very special process, resulting in a very special chain. The silver starts as coils of 16 gauge wire, subsequently formed into rings and cut loose. Then each is linked and soldered individually, and finished with a handmade clasp. There are literally days of solid work in this chain. It is said that there is a warmth or positive energy in a handmade chain that stands out. 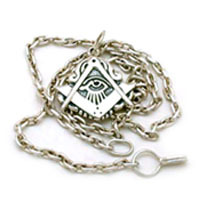 If you are considering this chain, please feel free to chat with me about it, send an email to studio@mastersjewel.com. Our standard length is 22". 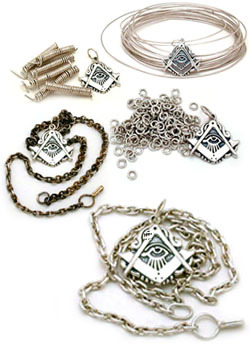 The silver set includes your choice of a silver Man Who Would be King Jewel, "G" Pendant, or the silver Original Mason's Jewel. Also available in longer lengths in the options.